Along with the Bible, I brought a stack of comics along with me on my trip with my wife, Cathy, to Kiev, Ukraine to bring our daughter, Bella (nee Masha) home. It is a lazy Sunday afternoon here in Kiev. Today started out sunny. Just a little while ago we had a thunderstorm blow over. Heavy downpour. It's good to be inside and listen to the sound of the rain on the windows. We were able to sign our daughter out of the orphanage on our court day, before we get our final court decree from the judge. She is here with us at the apartment while we wait. We will head back to re-sign her out on Tuesday. We get our court decree on Monday, May 12th; and then we will get her new birth certificate, tax ID number, Ukrainian passport, final physical and visa from the US Embassy so that we can return to the US. While we wait, we are working on her English, playing Uno, watching movies (with English captioning) and reading. While she plays video games on a tablet or one of our phones, I read. I am making my way through a stack of comics that I packed along with some books and the movies. It was a small suitcase. So, I had to pack what would fit. There were things that I didn't have room for that I wish I had. I have a long box devoted to The World's Finest comics. Over the years, I've had a handful of the original World's Finest Comics. I think I started reading the book in the late '70's or early '80, when it was a $1.00 anthology. World's Finest Comics was a comic book that started in 1941 that was devoted to Superman and Batman. Somewhere along the way, the two heroes actually started to team-up in World's Finest, and continued to until the book ended in 1986. Around the early to mid 1980's books like The Brave and the Bold (featuring Batman team-ups) and DC Comics Presents (featuring Superman team-ups) ended, too. Superman and Batman came back as a team just a few years ago, in 2003 with Superman/Batman. The book was re-launched just last year as Batman/Superman. In 2012, World's Finest was re-launched with Power Girl and The Huntress. I did bring along the trade paperback collection, from this long box, of the first six-issue story from Superman/Batman, "Public Enemies". I wish I had room to bring along John Byrne's Superman & Batman: Generations, too. It was set as an imaginary story, under the Elsewords imprint. 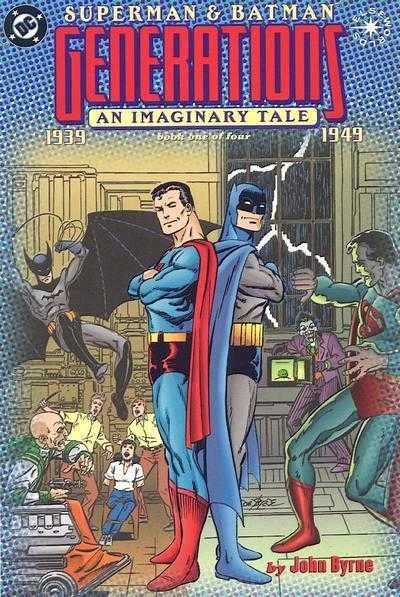 What if Superman and Batman had actually started their careers in 1938 and 1939 respectively. Each issue of the first two mini-series were divided in half. for instance, the first story in the first issue was set in 1939, with the two meeting for the first time at The World's Fair in Metropolis. The second story in the first issue was set a decade later in 1949. Each of the four issues in the first series was set ten years apart. It was brilliant to see the changes over each decade. The time jump in the second series was eleven years, starting in 1942. The second series was as enjoyable as the first, because it included other heroes like the Justice Society and Justice League and an alternate version of the Teen Titans. There was a third, twelve-issue limited series that was similar to the finale of Star Trek: The Next Generation, where an event happened in the past that was not understood or unraveled until years later. Superman and Batman had to go back and undo what had been done. I can only guess that by the third series the concept had run it's course. I would have loved to see John Byrne working on a Superman & Batman: Generations book that covered the Golden and Silver Ages. 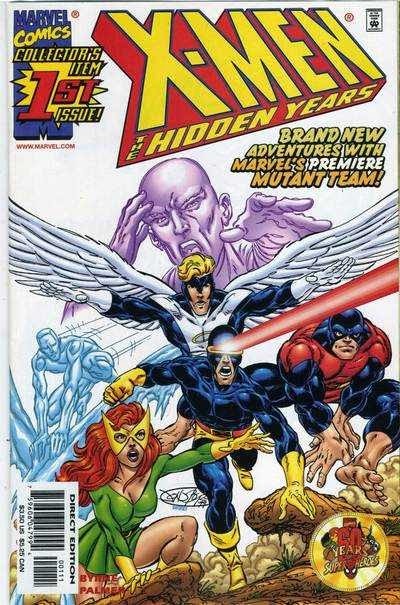 I enjoyed Byrne's work on X-Men: The Hidden Years, and his creator-owned The Next Men. I'm nostalgic; so, when Byrne brought Superman and Batman near the present, like in the '80's, '90's and '00's, he lost me. It made sense that Superman would age more slowly than mortal men and that through The Lazarus Pit, Batman would become immortal. It was just a shame to see them come back and outlive either protégés or children. Still, Generations was an enjoyable series. When the third series started, I had hoped that it would become a monthly book and focus more on the Golden and Silver Ages. A fanboy can dream. What I had done with Generations is that I had taken the first two series and put them together in chronological order. It was fun to see the story unfold over the years. Really, the only thing missing from Generations was Captain (Shazam!) Marvel. It would have been nice to see a cameo. Still, it was a Superman and Batman series. And in the Elseworlds of John Byrne, there will always be one Superman and one Batman. The same Superman and Batman over the years. Some years were kinder than others to The World's Finest. Comics I Wished I Brought With Me: Batman "Hush"